As the exclusive Learning Partner of NGV, we're proud to offer the La Trobe University community discounted membership and priority access to Australia's most visited art gallery. From 1 December 2018 to 7 April 2019, La Trobe students are invited to purchase a one-year Concession NGV Membership for just $55 when joining for the first time. Meanwhile, La Trobe employees and alumni can enjoy a one-year membership for $73 when joining for the first time. *Receive one free exhibition ticket with each year of Membership. Ticket is redeemable for all paid NGV exhibitions excluding Melbourne Winter Masterpieces. Offer available for La Trobe University students, staff and alumni only on presentation of valid identification. Our partnership with NGV unlocks plenty of clever opportunities. It represents a space where art, culture and education collide to create enriching, eye-opening experiences. As the gallery's official Learning Partner, we offer free public lectures and exclusive masterclass events where La Trobe experts share their in-depth knowledge to the wider community. We also offer exclusive experiences for La Trobe University students, such as the Art Now Summer School program that takes place within the NGV's gallery walls, NGV internships and Work Integrated Learning programs, student floor talks and lectures from guest speakers of the gallery. Image credit: M.C. 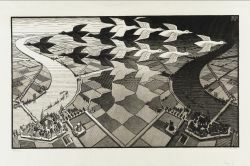 Escher Day and Night © The M.C. Escher Company, The Netherlands. All rights reserved.